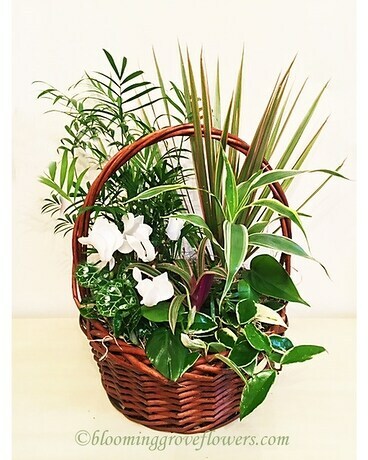 This basket of white cyclamen, red margin dracaena, ribbon plant, neanthe bella palm, show bush, and heart leaf philodendron is just right for any occasion. Please call to order. Plants and Containers subject to change based on season and availability. However we will create something similar using products with an equivalent value: we will find substitution to assure the best quality and presentation for your special gift.